December 20th, 2017. 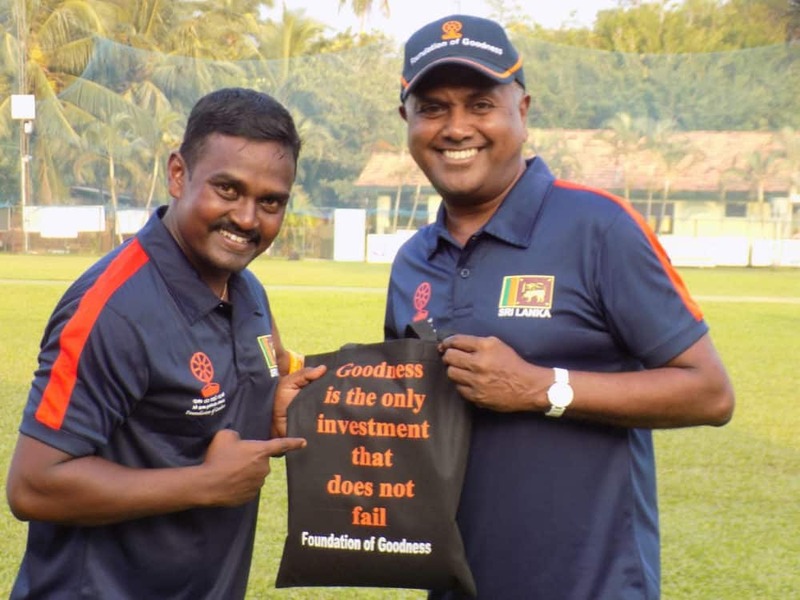 Community Impact Coach and Online Education Program participant, Benedict, writes about his experience attending CAC trainings in India, developing as a coach in the OEP program, and traveling as a Community Impact Coach to Sri Lanka working with CAC partner Foundation of Goodness. Little did I know, when I attended a training program in November 2016, with CAC that a few months later I would be given an opportunity to be a part of their Online Education Program. As thrilled as I was, I also was very anxious about the whole thing as I had no idea what the program was and the outcome of the program for me. All I knew was that I personally identified with the teaching methodology and the concept and that really excited me. As I started my journey with the Online Education Program I got to learn a lot, my teaching style changed the way I interacted with people – not only my players but even people of my community – and I started to feel more responsible towards society and youth. I had no idea that I would get an opportunity to go to other places or countries as a Community Impact Coach. When I was told about it, a little later after I started the OEP, I was thrilled beyond words as this is a major achievement for me and a dream come true. I always played sport and my community people considered me to be a failure when I didn’t get any employment opportunities through sports. It was at that time when I took it up as a challenge to prove that a lot can be achieved through sports. The opportunity that CAC has given me as a CIC empowers me to have so much pride in myself and in the work I do. When I received the mail about the sessions in other parts of India I was very excited and eager to join them. But it so happened that due to other commitments at work I was unable to be a part of it. I was really upset and felt very disheartened. I felt that my next chance to be a part of the training would be only next year until one night I received an e-mail from Mark that I would be going to Sri Lanka. At first I could not believe it! It took a while for it me to settle down. This was going to be my first flight experience and not just national but international….. I have always seen my colleagues who teach subjects like science, math etc travel to other countries on training and I always wanted to be the one to travel from sports for training as well. So when I saw my ticket, it was an unforgettable moment for me. Finally the time had come near and I got to meet Charlie, with whom I was to be traveling with. I worked with him for a week before we travelled and he gave me a lot of confidence in myself. I thought that we would have other coaches meet us directly at Sri Lanka but when I learned it was going to be just the 2 of us, I became really worried and nervous. That being said, Charlie made me feel very confident about myself. He gave me useful coaching tips and he gave me a lot of freedom to coach in my own style. This seldom happens in India we are expected to follow teaching methods of others and are not always allowed to be ourselves. He taught me how to maintain a journal of my daily activities and how to plan my sessions. This has all been very useful for me, and I have started implementing it in my regular schedules now, as well. Our Sri Lanka trip was not just all training and no fun… We had a lot of fun on the field and off the field. My off the field experiences are unbelievable as well. I accompanied a few volunteers from Foundation of Goodness when they went deep sea diving, though I didn’t go into the water myself just being in the middle of the ocean was an experience on its own. I felt like I was in a Bond movie doing one of the chasing scenes. This trip is a milestone in my carrier, I am using this as a tool to reach out to more people, both students and people in my community. I am putting to use everything that I have learned during this journey and I am looking forward to travelling on many more assignments. I want to thank CAC for giving me this opportunity and allowing me to learn from other communities as well. A special thanks to Markus for being a great instructor and a good support throughout the Online Education Program, and I’m happy that I came across a wonderful person like Charlie. Thank you Benny for this blog and your feedback. I am very happy and honored that you benefited so much from our support and the opportunities you were presented with. Your performance during the Online Education Program was excellent and your commitment and hard work outstanding! Thank you for being such a vivid part of the program this year!